I am so excited to be apart of the House of Cards Team! Each week we showcase a different style-but we all have the same challenge. Personally, I love to see the different takes on challenges. Everyone is so creative! The challenge is to use a bow or more. I am on the Cute and Fun Team. 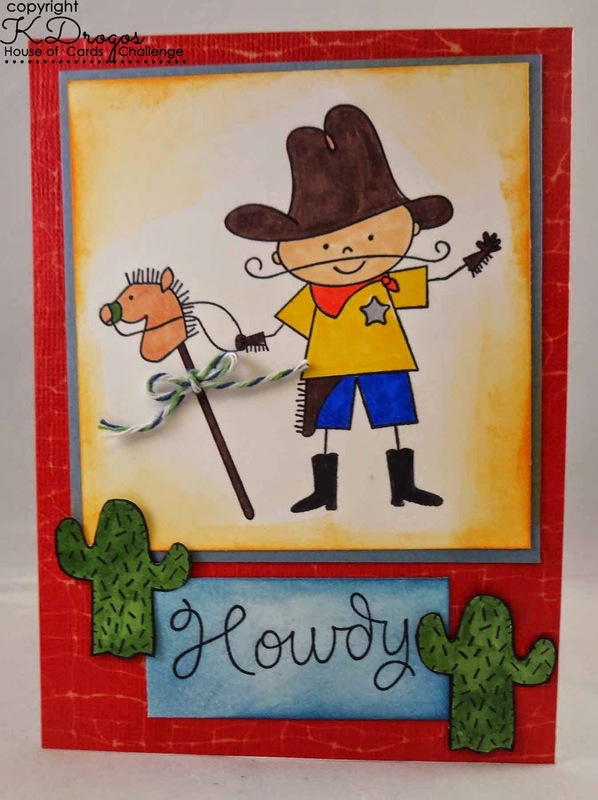 So for my Cute card, I used this super cute Cowboy set from Stampin' Up that a friend of mine gave me (awesomeness!). I used a shattered kraft core cardstock by Tim Holtz for the background. I used Copic Markers for the coloring. For the inking around the image and sentiment I used spiced marmalade and faded blue jeans distress inks. The twine is from Queen and Company. aww that is one cute cowboy..
Awww this is so cute Katy! I love that fun image and the added cactus! Such a cute cowboy! Glad to have you on the team!